TotalJobshub is a service where the content related to users’ search is presented in a best possible way. The information is researched and rechecked before it is finally conveyed to the end user. Through this academic portal students and job seekers will be enabled to get constant news and updates related to the ongoing and upcoming recruitment processes and exams. If the data presented to you in any way seems to be offending or violating proprietary rights, please feel free to contact us and help us come across the matter. With the help of multiple references, the Totaljobshub team represents and brings correct info to the users in a digital format. Also, the information and updates we provide here are absolutely free of any cost. 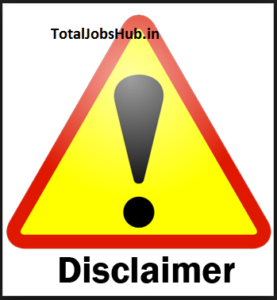 Note: Please be informed that Totaljobshub will not be held responsible if any notification gets changed after being published. Hence, maintaining the transparency in our work. However, if there is a change in plans as per the exam or recruitment authority policies, we tend to notify our visitors as shortly as possible. The aim of Totaljobshub team is to share information and knowledge to every visitor through this web portal. It would be the key role of this site. Even after every possible care is being taken to keep the integrity of the info, we sometimes, may not guarantee a hundred percent accuracy of the data. Some days and dates can be mentioned tentative as per our previous years’ observations.